Jeremy Webb reviewed the Tesla Model S 100D for Road tests and reviews, experiencing the rapid acceleration, and superb technology the car has. It's hydromatic, it's systematic, it's automatic, it's electrifying and goes like grease lightning. The Model S 100D, from Tesla is a fully electric vehicle EV, powered along by two motors. One front and one rear mounted so all four wheels are driven, and digitally controlled to distribute torque to each. This gives the Model S excellent handling and performance. Prior to driving the Model S I had not driven another electric vehicle and as most people have heard, there are reports of anxiety over range. Stories of people not being able to drive to relatives in different parts of the country for fear of being stranded without power to the car. Well Tesla can put all those anxieties to bed, as the 100D which stands for 100KW/H battery has a full charge range of 393 miles. This means when charged via SuperCharger and in optimium conditions owners have nearly 400 mile range available to them. Plenty to get you to the Northern parts of Great Britain, and a fair way in to mainland Europe. Ease of charging through a a variety of sources also dispels any worries on being without electricity. You will now be more worried by your phone dying than the car. All models come with two different charging cables, a black one which allows you to charge at home, a friend's or a hotel you might be staying at for instance. The other cable a light blue one, allows connecting to pay for charge meters which are being introduced in more and more places, and service stations. The process for charging is straight forward in both cases. 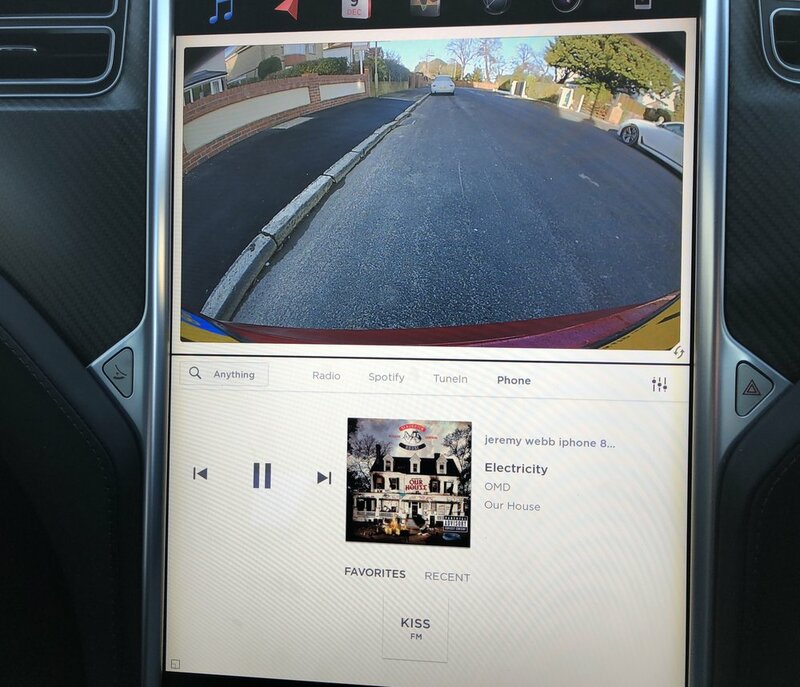 The third option which is available through Tesla when buying the car is a home wall Connector. This again is as simple as plugging in a kettle. When I charged the Model S overnight at home, I ran the main Tesla cable in to my house and plugged it in to a normal power socket. A nine hour charge gave 100 miles on the range indicator. When you are out and about you can always top up the range at charging points, such as supermarket car parks. Park near the charging point, connect the blue cable to the outlet and introduce the other end to the car. A little hatch pops open revealing the female input for the cable. Very cool. You have to pay for the amount of electricity used, but it is very inexpensive. An overnight charge at my house cost £3 and gave 100 miles, and compared to petrol 100 miles costs approx £15. The model S has plenty more cool technologies and specifications, then there is the performance to swoon about. The cockpit has two exceptional displays. A 17 inch touchscreen control panel allows driver and passenger to operate music, heating, navigation and much more. It can be full screen or split screen and show two systems at one time. It is linked to the driver's display. I was really impressed how the Model S handled and performed. It is a long and fairly wide car with plenty of room for five people and all their luggage, shopping etc. The car has an excellent low down centre of gravity, and Tesla have placed the battery in the car to provide this. Combined with all wheel drive, and the low centre of gravitiy traction is superb, with corners handled easily even at high speeds. You always feel safe and grip is extremely hard to lose unless pushed to the extreme. even when I did this the car came back under control quickly and easily. Performance is as I have mentioned, electrifying. No gears and direct drive power the car forward at a rate similar to a rollercoaster launch. woosh. Put your foot down and the road ahead runs out rapidly, unless you are on an airfield runway. 0-60mph in 2.5 secs is a super car beating figure, but figures don't tell the story when you are sitting behind the wheel and feel the sensation of going that quick. Tesla have now had to put in an update to allow drivers to pull away less quickly, as the immense acceleration was catching some people unaware. Needless to say I did not engage that option. Top speed is around 150mph, which I never reached on the public roads I had to contend myself to. Range obviously drops off at higher speeds but not that much, compared to fuel usage at the same speeds. Braking matches the speed going forward, and Tesla also have a great option here too. You can select for regenerative braking, which means any input on the brakes and slowing of the car puts charge back in to the battery. It also means lifting the accelerator acts like closing the throttle on a motorbike, the car slows through outside forces acting against it not just the brakes. You can see all around the car on the large display, and when reverse is engaged the display shows what is behind and around the vehicle. Summing up I love this car, and so do the people I took out in it. Recently I have driven some very high end cars and out of all of them, the Model S was the one people asked if we could keep. The cost of the Model S 100 D is quite high, but you get a lot for your money, you also benefit from very low running costs, including Taxes. If you were using one, in one of the many cities throughout the world introducing higher and higher congestion and pollution taxes, then the car would make even more sense to own. From my point of view it is not just the money it is that performance. Being as the modern term is a petrolhead, my love and joy is how the car drives. The Tesla drives superbly enough to turn me away from petrol.